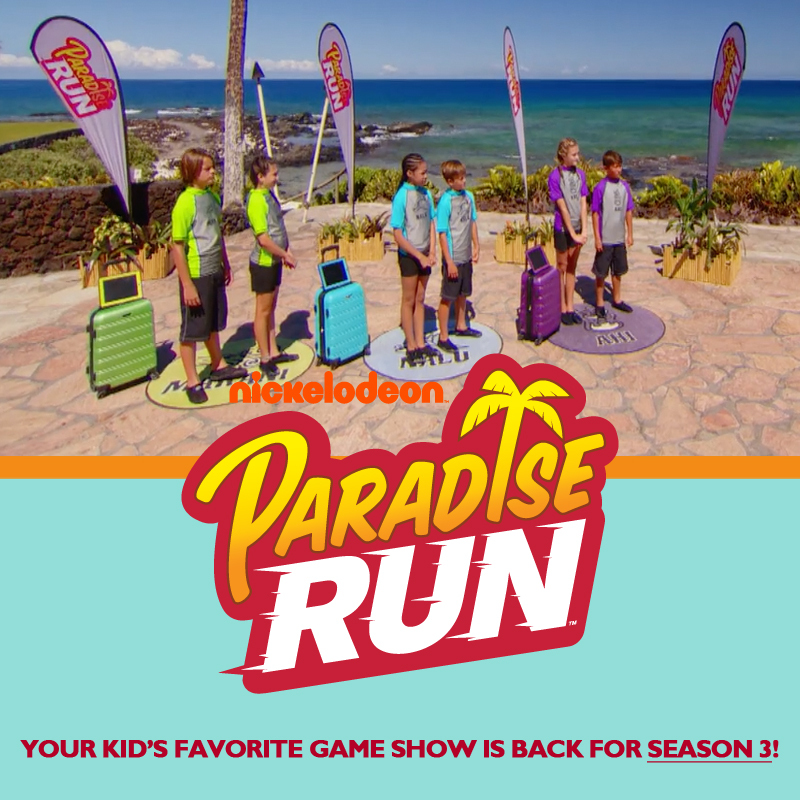 Last Chance To Apply To Be A Contestant On "Paradise Run" Season 3! 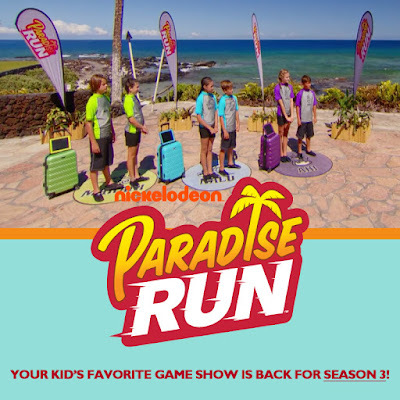 Nickelodeon is seeking enthusiastic kids, ages 11 to 15, to audition in teams of two and compete in the third season of the networks hit adrenaline-pumping competition series Paradise Run! The duos can be best friends, siblings, cousins, classmates or neighbors. The Hawaii-filmed competition includes land and water activities such as obstacle courses, zip-lining and paddle-boarding, and mental challenges that include solving riddles and puzzles. Applicants should exude confidence, a competitive drive and have lots of energy. “The kids should be athletic but also smart. If one person is athletic and the other is smart, they can work as a team,” said Jack Marash, the supervising talent producer. Contestants must be available for a 48-hour period to film in Hawaii sometime in May or June. Contestants must not have appeared on a game or reality show in the past year. 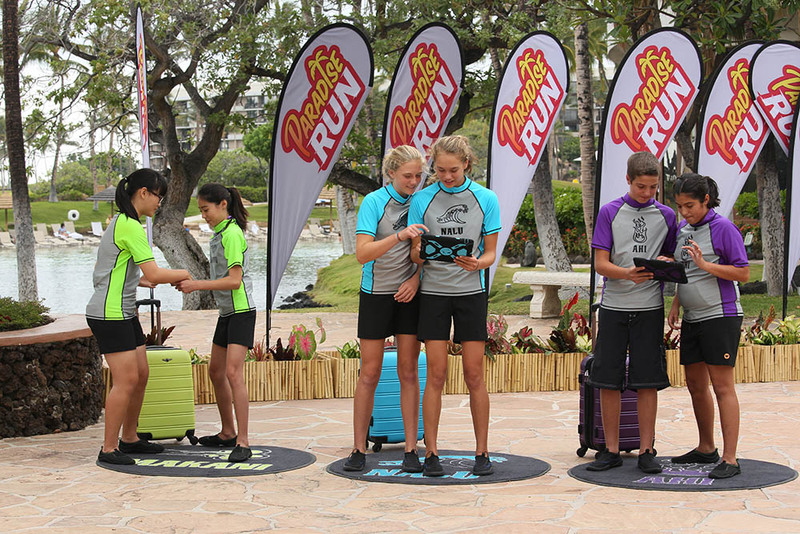 The three chosen teams will vie for a ultimate paradise vacation experience! Friday 12th May 2017 is the deadline for parents to apply for their kids. For more information, email Allie Stone at allie@mysticaartpictures.net or call 323-536-9999. Good luck! More Power Rangers: BOOM! Studios and Saban Brands Announce New Ongoing "Power Rangers" Comic Series, "Go Go Power Rangers"! More Nick: Nickelodeon USA's May 2017 Premiere Highlights! More Nick: Fraggle Rock - Saturday Morning Acapella! Watch Jace, Ella and Sean on Nickelodeon and TeenNick! More Nick: Tune Into The Brand-New Show "Hunter Street", Weekdays At 5:30pm, Only On Nickelodeon UK! Follow NickALive! on Twitter, Tumblr, Google+, via RSS, on Instagram, and/or Facebook for all the latest Easter on Nickelodeon UK and Henry Danger News and Highlights! Scene from The Loud House episode "Study Muffin". Di Più Nickelodeon: Nickelodeon Italy To Premiere "Rufus 2" On Wednesday 3rd May 2017! A dog has eaten the head of Marc Summers ... who must now traverse the carnivorous canine's digestive tract ... which happens to resemble a rather familiar obstacle course that we all know and love! Animation by Mighty Fudge Studios. Music by Honchie. More Nick: How To Make Green Slime | On Your Marc! More Nick: Phil Moore Launches GoFundMe Campaign For New Video Game Competition Show "Battle Arcade"! Labels: Animation, Classic Nickelodeon, Double Dare, Nickelodeon Presenters And Hosts, Nickelodeon USA, Nickelodeon Video Clips, NickSplat, The '90s Are All That, The Splat, What Would You Do? Watch Cree Cicchino on Game Shakers! Sie kann einfach mega singen! All the rules you break. Make me wanna run, but I can't escape. Most of them are lies, but I'm listening. I know for certain that I'm loosin' all control, oh o--o--oh no, no. "Bad Boys" is written by Chris DeStefano and Kara DioGuardi. Follow NickALive! on Twitter, Tumblr, Google+, via RSS, on Instagram, and/or Facebook for the latest Nickelodeon Germany, Nicknight and Victorious News and Highlights! More Nick: Nickelodeon Latin America Commences Production On "Vikki RPM" In Miami, Fl! Смотри в мае на Nickelodeon from Nickelodeon_RU on Vimeo. Additionally, Nickelodeon Россия will air marathons (марафоны) of Pig Goat Banana Cricket (Свин Коза Банан Сверчок) and School of Rock (Школа Рока)! Watch Henry Danger on Nickelodeon and TeenNick! He smashes, he bashes – no one’s making a move quite like the part monster machine, part triceratops, Zeg. Learn more about Zeg and don’t forget to watch Blaze and the Monster Machines on Nick Jr. Practice your Dutch with the machines from Blaze and the Monster Machines! You want speed? He's got it! You want power? Blaze is unstoppable! He's the machine that's leading the pack. Learn more about Blaze and don’t forget to watch Blaze and the Monster Machines on Nick Jr. Practice your Dutch with the machines from Blaze and the Monster Machines! Follow NickALive! on Twitter, Tumblr, Google+, via RSS, on Instagram, and/or Facebook for the latest Nickelodeon Netherlands, Nick Jr. Nederland and Blaze and the Monster Machines News and Highlights! He smashes, he bashes – no one’s making a move quite like the part monster machine, part triceratops, Zeg. Learn more about Zeg and don’t forget to watch Blaze and the Monster Machines on Nick Jr. Practice your German with the machines from Blaze and the Monster Machines! You want speed? He's got it! You want power? Blaze is unstoppable! He's the machine that's leading the pack. Learn more about Blaze and don’t forget to watch Blaze and the Monster Machines on Nick Jr. Practice your German with the machines from Blaze and the Monster Machines! More Nick: Blaze and the Monster Machines; PAW Patrol; Rusty Rivets; Shimmer and Shine | Theme Songs in German | Nick Jr. Deutschland! Follow NickALive! on Twitter, Tumblr, Google+, via RSS, on Instagram, and/or Facebook for the latest Nickelodeon Germany, Nick Jr. Deutschland and Blaze and the Monster Machines News and Highlights! Don't miss a brand new TeenNick Top 10, hosted by Cree Cicchino, tonight (4/28) at 9PM ET/PT, only on TeenNick USA! É proibida a entrada de animais, skate e bicicleta. More Nick: Nickelodeon Brazil Unveils Plans For 2017 And 2018! Follow NickALive! on Twitter, Tumblr, Google+, via RSS, on Instagram, and/or Facebook for the latest Nickelodeon Brazil and Worldwide Day of Play News and Highlights! Follow NickALive! on Twitter, Tumblr, Google+, via RSS, on Instagram, and/or Facebook for the latest Nickelodeon Brazil and Heidi, Bem-Vinda à Casa News and Highlights! Watch more Sanjay and Craig on Nickelodeon and Nicktoons! Scene from ALVINNN!!! and The Chipmunks episode "Super Girls". Retrouve plein de vidéos d'Alvinnn!!! et les Chipmunks sur NICKELODEON JUNIOR ! Watch more ALVINNN!!! and The Chipmunks on Nickelodeon and Nickelodeon Junior! Plus Nickelodeon: Nickelodeon 4Teen France To Premiere "Hunter Street" On Monday 1st May 2017! Follow NickALive! on Twitter, Tumblr, Google+, via RSS, on Instagram, and/or Facebook for all the latest Nickelodeon Junior France and ALVINNN!!! and The Chipmunks News and Highlights! Nickelodeon Australia and New Zealand will premiere the brand-new Nickelodeon Original Movie Rufus 2, a sequel to Nick's hit 2016 TV movie, on Friday 5th May 2017 at 6:30pm (AU) and 7:30am (NZ; encore at 10:00pm)! Everyone’s favourite Dog-turned-dude, Rufus, is back for Rufus 2! Join Nickelodeon favourites, Jace Norman (Henry Danger, Splitting Adam), Davis Cleveland (Legendary Dudas, Shake It Up), Haley Tju (Bella and the Bulldogs) and Jade Pettyjohn (School of Rock) in the sequel movie event. After Manny wished he had more friends, his loyal Labrador, Rufus, turned into a real boy with the help of a enchanted medallion! Now that Rufus has been a human for longer, he no longer chases Squirrels, eats without utensils, asks for belly rubs, or catches flying discs with his mouth. 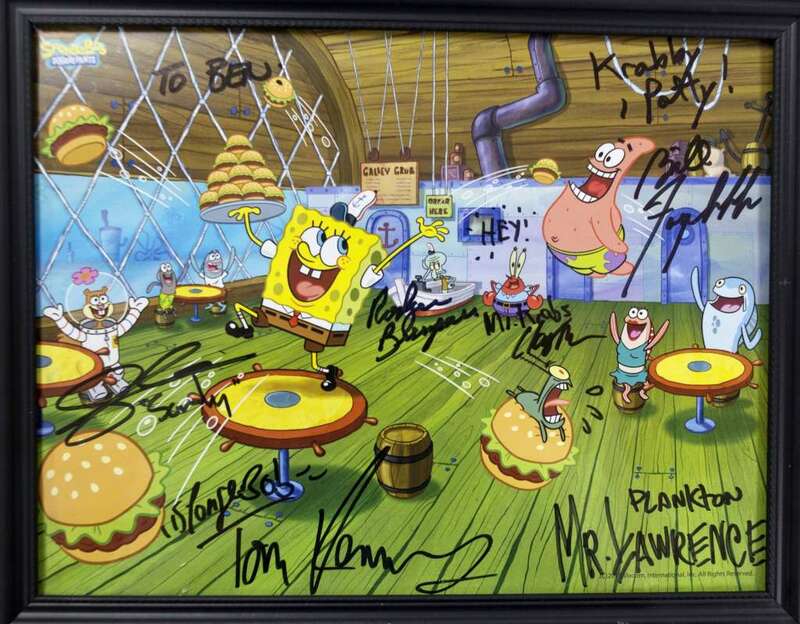 Jefferson Middle School sixth-grader Ben Stebleton's uncanny ability to draw characters from Nickelodeon's hit original animated series SpongeBob SquarePants has gotten him recognition from the cast of the long-running cable series! 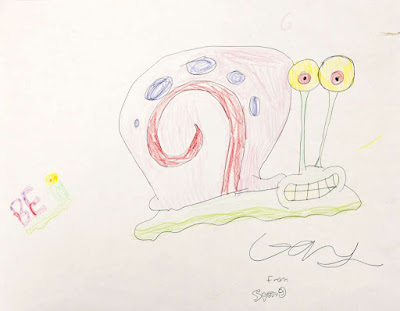 When art teacher Allison Brady saw Ben's depiction of Gary the Snail, she contacted Nickelodeon Animation in Burbank, California and sent them pictures of Ben's rendering of Gary. They were so impressed that they sent back a picture of SpongeBob characters signed by the actors who provide voices for the denizens of Bikini Bottom! "They sent him this autographed photo," paraprofessional Mary Priest, who works with Ben each day, told the Midland Daily News as she pointed to an image of the photo on her phone. She and Ben took some time Wednesday to describe his art and other projects. 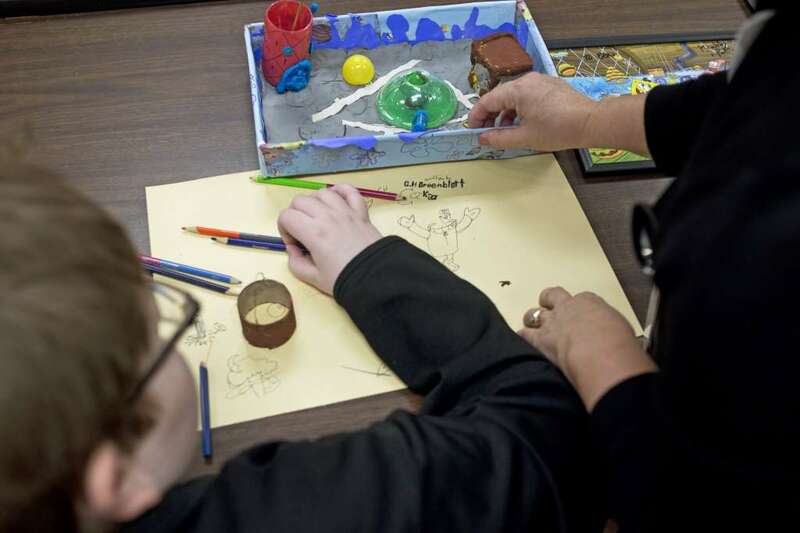 Ben, who has autism, has artistic talents that go beyond drawing. He created a large model of the "recycling center" sometimes seen in SpongeBob episodes and books. "It’s all out of recycled material," Priest said. Ben is planning more projects including creating models of the Krusty Krab restaurant (where SpongeBob works) and of a submarine used on a few occasions by SpongeBob and his pal Patrick Star. "Every day he hands me a list with all the items needed and how he’ll put it together," Priest said. His fascination with SpongeBob extends to having memorized the credits at the end of each SpongeBob SquarePants movie, she added. Ben is one of six students in Ed Bailey's special education class at Jefferson. Liz Shuster, an autism spectrum disorder (ASD) specialist, teaches a class of eight students at Jefferson. 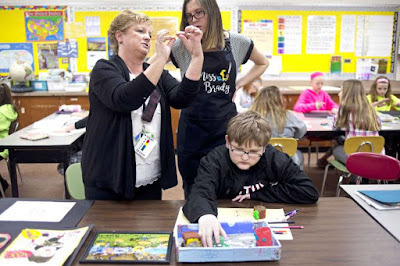 As Autism Awareness Month nears its end, Shuster said it’s important to recognize the talents these students have and to encourage their progress. "We reinforce their use of appropriate behavior," she said. "We want to reinforce the skills we want them to have." Ben, described by Priest as "a whiz on the computer," also produces a weekly newsletter profiling one of his classmates. He comes up with the questions for each issue of "Splat," and interviews his subjects face to face, asking them questions like "How old are you?," "What grade are you in?," "How many people are in your family?" and "What is your favorite class?" Priest also noted he was a quick study learning the computer keyboard, and now types 59 words per minute at 99 percent accuracy. While he has proved to be a very proficient typist, Ben affirmed that his favorite class is art. Artwork by Ben and other students goes on display Friday at Midland Mall, where there will be a reception Friday afternoon. The works will be on display until Saturday 6th May 2017, Priest said. The Midland County Educational Service Agency operates seven autism spectrum disorder (ASD) programs in school districts across Midland County, Michigan, with a total of about 50 students in the programs, said MCESA Supervisor of Special Education Christi Owens. "These students have educational needs beyond which their local school district can provide and so they are programmed for by MCESA," Owens said. There are four elementary-level programs, two middle school programs and one high school program, she said. The evidence-based, team-based model used in the programs means that each classroom has an assigned speech-language therapist, occupational therapist, physical therapist, psychologist and social worker. 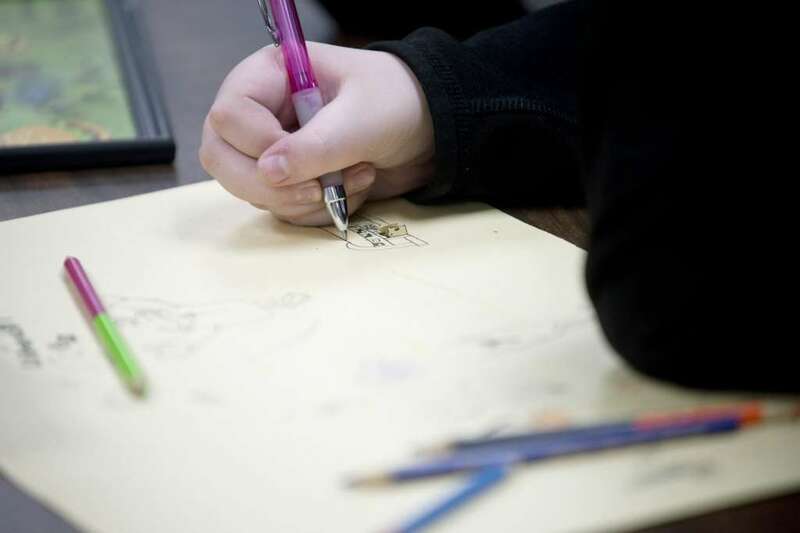 MCESA also provides services for children, birth through early childhood and through post-secondary age for students on the autism spectrum, Owens said. A total of about 200 children across the county receive special education support and services under ASD eligibility in Midland County. 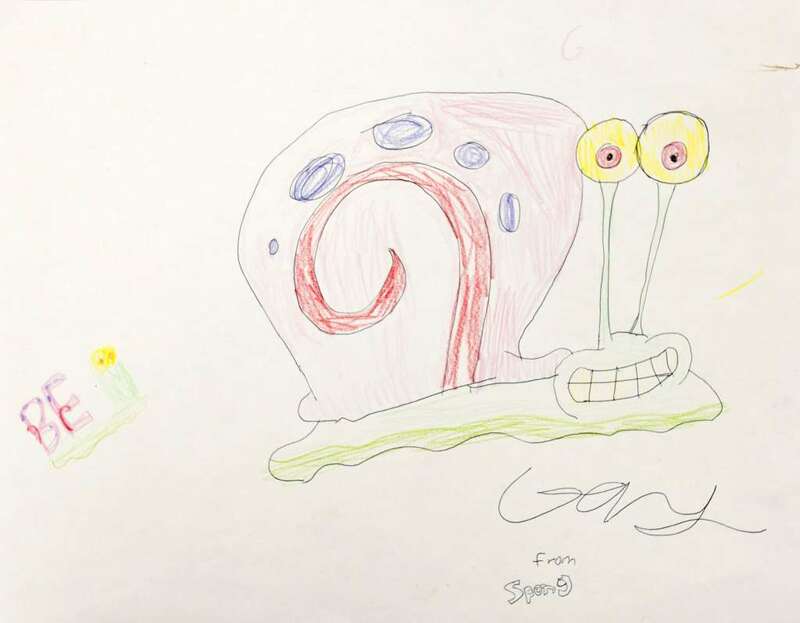 Check out Ben's Sponge-Tastic picture of Gary, and the aweslime SpongeBob photo Nick Animation sent him, above! More Nick: SpongeBob SquarePants Makes Surprise visit to County Durham school | Jeans for Genes Day | Nickelodeon UK! Follow NickALive! on Twitter, Tumblr, Google+, via RSS, on Instagram, and/or Facebook for the latest Nickelodeon Animation Studio and SpongeBob SquarePants News and Highlights! NEW YORK--(BUSINESS WIRE)--Thousands of Viacom employees will volunteer today in a companywide effort to aid their local communities by donating time and resources for causes around the globe. Viacommunity Day, a decades-long program run in partnership with dozens of non-profit organizations and civic leaders, has employees participating in a diverse range of philanthropic activities, including refugee, citizenship and immigration assistance, public beautification initiatives, job development training, student mentoring opportunities and other acts of giving. In total, more than 20,000 hours of service will be donated by Viacom and its brands worldwide. * Assembling hygiene kits for victims displaced by the global refugee crisis, in partnership with the International Medical Corps. * Assisting school staff at Xingxingyu Special Education, and providing entertainment and care for students with autism. * Volunteering at non-profit organization Thistle Farms, whose mission is to heal, empower, and employ female survivors of trafficking, prostitution and addiction. * Donating legal aid to foreign citizens and nationals participating in the naturalization process, in partnership with Legal Services NYC. * Partnering with the Office of the Municipal Environment and Natural Resources to participate in beach clean-ups in Barangay San Juan, Ternate and Cavite. * Providing job training to 18-25 year olds interested in working in the TV and media industry, in partnership with MAMA Youth. 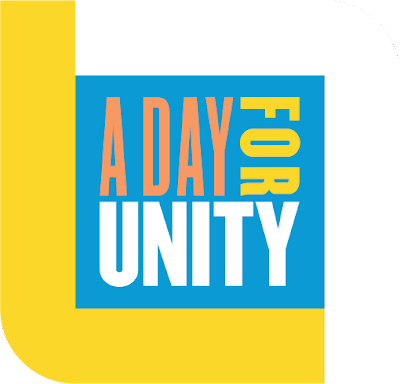 To get updates about Viacommunity Day 2017, follow us on Twitter @Viacommunity using #ViacommunityDay2017. More information about Viacommunity can be found at viacommunity.com. JOLIET, Ill. (APRIL 28, 2017) – Chicagoland Speedway and Nickelodeon today announced that the number-one entertainment brand for kids is the entitlement sponsor of the Monster Energy NASCAR Cup Series race on Sunday, Sept. 17, dubbed the Tales of the Turtles 400 at Chicagoland Speedway. The announcement was made atop the 360 Chicago Observation Deck by Chicagoland Speedway President, Scott Paddock and Nickelodeon Senior Vice President of Sports Marketing, Anthony DiCosmo. the second partnership for Chicagoland Speedway and Nickelodeon, who last year partnered to bring fans the Teenage Mutant Ninja Turtles 400. This is the seventh consecutive year Chicagoland Speedway will kick off the Playoffs for the Monster Energy NASCAR Cup Series. During the Tales of the Turtles 400 race weekend, attendees will be able to enjoy fun family activities with appearances by the Teenage Mutant Ninja Turtles costumed characters and more. The Tales of the Turtles 400 ticket package includes a meet and greet with the Teenage Mutant Ninja Turtles, a race ticket and the new Tales of the Turtles DVD. Raphael and Michelangelo admiring the view atop Chicago 360. The official Tales of the Turtles 400 race shirt will be available on the NASCAR.com Superstore today at 2:30 p.m. CT/3:30 p.m. ET. The announcement, which was made on National Superhero Day, marks the kickoff of Chicagoland Speedway’s brand-new initiative to recognize everyday heroes leading into and on race day. Chicagoland Speedway will give fans the opportunity to nominate their own personal hero to receive a VIP race day experience and serve as race Grand Marshal. Fans can nominate their hero at www.chicagolandspeedway.com/hero. Creative elements for the Tales of the Turtles 400 race will be inspired by Nickelodeon’s season five anthology series, Tales of the Teenage Mutant Ninja Turtles. This season captures seven distinct stories featuring Leonardo, Raphael, Donatello and Michelangelo’s past and future, including their early days in New York City, encounters with villains and friends, and a peek into their distant, but wild future. Throughout the season, fans can expect to see both new and familiar friends and foes as each tale unfolds. New episodes premiere throughout 2017 on Nickelodeon. Since its launch in 2012, Nickelodeon’s all-new CG-animated Teenage Mutant Ninja Turtles has re-energized these iconic characters of this wildly popular franchise. Currently in its fifth season, Teenage Mutant Ninja Turtles is seen in over 170 countries and territories and translated in 45+ languages. Teenage Mutant Ninja Turtles follows four mutant turtles—Leonardo, Raphael, Donatello and Michelangelo—trained in the art of ninjutsu by their mutant rat sensei, Master Splinter, who teaches the turtles to battle evil from the New York City sewers. Nickelodeon has a long-standing relationship with NASCAR, teaming up with the motorsports giant on several programming and racing events. On the track, the network has sponsored several races including last year’s Teenage Mutant Ninja Turtles 400 at Chicagoland Speedway. On-air both brands have collaborated on and Hammer Down, which aired on Nicktoon’s NickSports block. The Monster Energy NASCAR Cup Series race at Chicagoland Speedway will take place on Sept. 17 as part of the four-race weekend September 14-17. The weekend will kick off on Thursday, Sept. 14 with the ARCA Racing Series followed by NASCAR Camping World Truck Series, under the lights on Friday night. On Saturday, Sept. 16, the NASCAR XFINITY Series will hit the track as the precursor to Sunday’s Monster Energy NASCAR Cup Series showdown, the first race in the NASCAR Cup Series playoffs. More Nick: Artists in Action: Sebastian Evans | Teenage Mutant Ninja Turtles | Nickelodeon Animation! Watch more Zoey 101 on Nickelodeon, TeenNick and Nicknight! Mehr Nick: iCarly - Zukunftsvisionen aus dem Jahr 2077 | Nicknight | Nickelodeon Deutschland! Follow NickALive! on Twitter, Tumblr, Google+, via RSS, on Instagram, and/or Facebook for the latest Nickelodeon Germany, Nicknight and Zoey 101 News and Highlights! He smashes, he bashes – no one’s making a move quite like the part monster machine, part triceratops, Zeg. Learn more about Zeg and don’t forget to watch Blaze and the Monster Machines on Nick Jr. Practice your Spanish with the machines from Blaze and the Monster Machines! You want speed? He's got it! You want power? Blaze is unstoppable! He's the machine that's leading the pack. Learn more about Blaze and don’t forget to watch Blaze and the Monster Machines on Nick Jr. Practice your Spanish with the machines from Blaze and the Monster Machines! Follow NickALive! on Twitter, Tumblr, Google+, via RSS, on Instagram, and/or Facebook for the latest Nickelodeon Spain, Nick Jr. España and Blaze and the Monster Machines News and Highlights! He smashes, he bashes – no one’s making a move quite like the part monster machine, part triceratops, Zeg. Learn more about Zeg and don’t forget to watch Blaze and the Monster Machines on Nick Jr. Practice your Polish with the machines from Blaze and the Monster Machines! You want speed? He's got it! You want power? Blaze is unstoppable! He's the machine that's leading the pack. Learn more about Blaze and don’t forget to watch Blaze and the Monster Machines on Nick Jr. Practice your Polish with the machines from Blaze and the Monster Machines! More Nick: Blaze and the Monster Machines; PAW Patrol; Rusty Rivets; Shimmer and Shine | Theme Songs in Polish | Nick Jr. Polska! Follow NickALive! on Twitter, Tumblr, Google+, via RSS, on Instagram, and/or Facebook for the latest Nickelodeon Poland, Nick Jr. Polska and Blaze and the Monster Machines News and Highlights! More Nick: Meet "The Loud House" Creator Chris Savino At "House Of Secrets" In Culver City, CA On Free Comic Book Day! Clip from Rugrats episode "Runaway Angelica". More Nick: Nickelodeon's Iconic Babies Arrive On DVD In Two Special "Rugrats" Full-Season Collections! More The Splat: The Ferals | Theme Song with Lyrics | The Splat | #TBT | Nickelodeon UK! Follow NickALive! on Twitter, Tumblr, Google+, via RSS, on Instagram, and/or Facebook for all the latest Nickelodeon Italy and The Fairly OddParents News and Highlights! Composer Jim Lang has unveiled a fantastic video featuring live performances of a few pieces of music from the soundtrack of Nickelodeon's iconic '90s animated series Hey Arnold!, as well as potential music from Nickelodeon's upcoming brand-new two-part Hey Arnold! television movie, Hey Arnold! : The Jungle Movie! Jim has also teased in the videos' description on YouTube that he'll be attending Comic-Con International: San Diego 2017! First time sitting down with this great crew to play through lil'bluehat charts in progress. Doin the #HeyArnold classics and some new tunes on the same tip. Look out Comicon. More Nick: Craig Bartlett Unveils New Storyboard Panel From "Hey Arnold! : The Jungle Movie"! Set to premiere this Thanksgiving on Nickelodeon USA, Hey Arnold! : The Jungle Movie will pick up where the original series ended, resolving unanswered questions and plot lines, including Arnold finally getting answers about the whereabouts of his missing parents! More Nick: Nickelodeon Greenlights "Invader Zim" TV Movie! Outer Planet Ditty, Invisible Hippo, Home Wit Jerome, Ringading. H/T: ToonZone Forums member Super Batman. Follow NickALive! on Twitter, Tumblr, Google+, via RSS, on Instagram, and/or Facebook for the latest Nickelodeon and Hey Arnold! : The Jungle Movie News and Highlights! Watch more School of Rock on Nickelodeon, and play the brand-new game "Together We Rock" on nick.co.uk/good! More Nick: Nickelodeon UK To Host "Together For Good Together We Rock Marathon" On Monday 1st May 2017! Mehr Nick: Nickelodeon Germany To Premiere "Hunter Street" On Monday 8th May 2017! 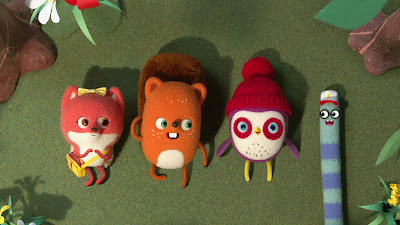 To celebrate Nickelodeon USA premiering the brand-new Nicky, Ricky, Dicky & Dawn season three episode "I Want My Mae B. Back" on Saturday 29th April 2017 at 8:30pm ET/PT, Nick USA has unveiled a quad-tastic sneak peek preview from the all-new NRDD episode, which you can watch in the fantastic video clip here on nick.com! In the brand-new Nicky, Ricky, Dicky & Dawn episode "I Want My Mae B. 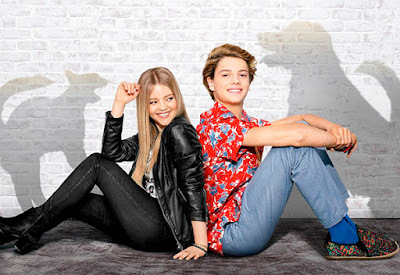 Back" (#311), Dawn (Lizzy Greene) becomes jealous when Mae (Kyla-Drew Simmons) starts spending time with Miles (Theodore Barnes, Legendary Dudas, Brooklyn Nine-Nine), so she enlists the help of her brothers to separate them. In Nick's super sneak-peek, "Fourth Wheel", Dawn's BFF, Mae, has a boyfriend, and now she is stuck being the third wheel with them... or being the fourth wheel with her brothers! Fans in the UK and Ireland can catch brand-new episodes of Nicky, Ricky, Dicky & Dawn season three weekdays at 4:00pm from Monday 1st May 2017, only on Nickelodeon UK & Ireland/HD! More Nick: Nickelodeon Greenlights "Nicky, Ricky, Dicky & Dawn" Season Four! Additional sources: Screener TV Listings, IMDb. Adams, Massachusetts native, actor and Emmy Award-winning broadcaster, Evan M. Pinsonnault, will return to a regional stage next month, though many of his friends and fans might not immediately recognize him. Pinsonnault, who's known by his stage name, Evan Michael, is currently playing the roles of "Daddy Pig," "Mr. Bull" and "Danny Dog" in the interactive musical live show, Peppa Pig LIVE! : Peppa Pig's Big Splash, inspired by the characters and stories from the popular British animated children's television show. In the U.S., the program airs on Nickelodeon and Nick Jr. The stage show splashes down in Springfield for the final performance in its spring 2017 tour at Symphony Hall in Springfield at 2 p.m. on Sunday, May 7. This is the show's first tour through the U.S. and Canada, and Pinsonnault has previously toured with the production across more than 90 international cities. Pinsonnault is a 2001 graduate of Hoosac Valley High School, where he performed in a number of theatrical productions. He is the son of Bernie Pinsonnault and stepson of Dianne Cutillo of Adams and of Jan Charbonneau and Stan Spencer of Lenox. When he is not touring, the actor resides in Los Angeles and has also enjoyed gigs as a comedian, television anchor and broadcaster, show host, and writer. In a September 2016 interview with Georgia arts and entertainment publication, "DoSavannah," Pinsonnault said his career has been inspired by his hometown region. He told the interviewer, "I grew up in western Massachusetts in Berkshire County. It's such a great community for the arts. ... I just remember all these great times of going to see live theater at such a young age." After graduating from George Washington University with a degree in political science and theater, Pinsonnault earned a master's degree in broadcasting and communication from the S.I. Newhouse School of Public Communications at Syracuse University. He began his career as a television reporter and anchor, working in upstate New York, Washington, D.C., Georgia and Michigan, while performing in theatrical productions on the side. While in Michigan, he created, produced and hosted a variety program, The Evan Michael Show, which prompted his move to L.A., to further explore opportunities on stage and screen. Tickets to see Peppa Pig LIVE! : Peppa Pig's Big Splash at Symphony Hall in Springfield can be purchased on Ticketmaster. VIP party upgrade packages are also available for purchase on cidEntertainment.com. Follow NickALive! on Twitter, Tumblr, Google+, via RSS, on Instagram, and/or Facebook for the latest Nickelodeon, Nick Jr. and Peppa Pig News and Highlights! Charlotte, NC Voiceover Artist Lends Voice To New Preschool Series "Becca's Bunch"
She tried for years to hide her voice. Then she made a career out of it. Lisa Biggs is a 36-year-old woman with an asymmetrical haircut; when she takes her shoes off, you can see the tattoos on her feet. But the voice that comes out of her mouth sounds like an 8-year-old girl: high-pitched and squeaky, with the vocal timbre of a grade-schooler asking for an extra carton of chocolate milk. Biggs spent years trying to disguise that voice, but these days it pays her rent: she makes her living as a professional voiceover artist. Standing in bare feet in the Concentrix Music studio in the Cotswold area of Charlotte, wearing jeans and a gray V-neck sweater, Biggs is recording dialogue for the brand-new cartoon Becca’s Bunch, slated to debut on Nickelodeon USA this fall, followed by a roll out onto Nickelodeon and Nick Jr. channels internationally soon after. Biggs plays six of the seven children in a Rabbit family, plus the mom, Lola Bunny. A producer of the show is listening to her from Ireland via an Internet line, giving Biggs feedback and explaining where her dialogue fits into the plot. Every time Biggs reads a line, she performs it three times, offering minor variations so the producers have options to choose from. “Where is that float?”: bubbly but confused. “Where is that float?”: even more enthusiastic. “Where is that float?”: slightly breathless. Then the producer asks Biggs to be “more projective,” so she does it three more times. So what separates a professional voice artist from a civilian who sounds mellifluous on the phone? Biggs has been the voice of everything from fuzzy toys (many, including Hasbro’s Furreal Friends) to victims of videogame zombies (a trailer for the game The Dying Light). She’s played Charlie Brown in a Peanuts iPhone app and the Care Bear Wonderheart in American Greetings commercials. In recent years, she’s branched out to directing kids (most recently, a series of Toys R Us radio ads) and founding Voxy Ladies, a professional association for voiceover women (Biggs says she sold it last year so she could focus on her own career). She’s hoping to expand into the “radio imaging” business, where she gives radio stations their identity by recording their promo spots. Biggs says, “In the inner circle of working professional voice talent, you’ve got some guys that make five, six million dollars a year or more.” Members of that elite club include the top movie-trailer voices and the cast of The Simpsons. Lisa Biggs is also the voice of BeatBelle, a Fisher-Price toy, and Harley, a little boy featured in promotions for the international tech company Hisense. “It” didn’t seem like a blessing for Biggs when she was growing up in Lancaster, South Carolina, daughter of a fireman and a preschool teacher. Other kids called her names – “Squeaky, Smurfette, Beaker, Minnie Mouse” – and accused her of speaking in a high-pitched voice just for attention. She stopped speaking in class: “I made OK grades, but I bet if I actually participated I would have had a better GPA,” she says. When she had to give an oral presentation in a high-school biology class, she thought she could disguise her voice by adopting a strong Southern accent – a huge mistake, since she not only didn’t fool anybody, she confirmed the suspicions of classmates who thought she was faking. “I tried to mimic other people and the way that they talked, mostly their cadence. I had to think about tempo and volume and pitch,” Biggs remembers. She wanted to be a marine biologist, but unwittingly, she was training for a voiceover career. When Biggs was an undergraduate at Lee University, people would occasionally tell her that she should look into voiceover work, which she resisted, thinking it as likely a career choice as becoming an astronaut. But when she saw a brochure for an acting school in New York that included a class on voice work, she enrolled for the summer session. She learned a lot, but she also found that even in acting school, her voice provoked hostility. One teacher told her: “You need to quit this little-girl-voice act before you’re 30. Nobody buys it.” Another informed her that she spoke like that because of childhood trauma and her voice had frozen at that age. Nevertheless, after college graduation she headed to Los Angeles to try her luck at voice acting. She got her SAG card and some tattoos – “because that’s what you do,” she jokes – and even had a supporting role on one episode of The Simpsons (playing a boy Lisa Simpson had a crush on). But she wasn’t making a living from her voice. And when she tried networking with an older voiceover actor at a convention, she says, he just leered at her and said derogatory remarks. Biggs returned to Charlotte in 2006, planning to go to graduate school or enter a youth ministry. But her return coincided with a shift in the voiceover world: The industry had decentralized, and the Internet had made it possible to do sessions in cities other than L.A. Biggs hired a manager and gradually built up her career. Biggs developed a range of voices, from a teenage girl to a sassy old lady. Her second-most popular voice is a little girl, but the voice she gets hired to do most often is a young boy. She started off trying to do a gravelly boy voice, like Milhouse on The Simpsons, but quickly found that it hurt her throat too much. Instead, she tapped into a character she calls “Liam”: a swaggering skateboard kid in the mode of 1990s preteen idol Jonathan Taylor Thomas. This is the cast of characters from “Badanamu,” a show Biggs cast, voice-directs and stars in. (She’s the voice of both Jess and Curly – the pink and purple guys on the right – as well as all three of The Three Kittens, and “a slew of additional characters.”) It’s scheduled to air in France, Spain, Australia and China, she says. Biggs had a pleasant surprise at the Concentrix Music studio: The Becca’s Bunch producers wanted Lola Bunny to rap a song. “This is the closest I’ll ever come to being a pop star,” she squealed. “I’ll just savor the moment.” Told that the track sounded like J.J. Fad’s Supersonic, Biggs rapped the 1988 single from memory.